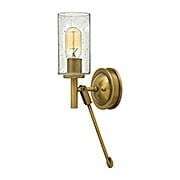 Our eclectic Mid-Century wall sconces provide exciting lighting possibilities for every room in your home. From sleek and modern sconces to simple, minimalist designs, you'll find originality and freshness in this unique collection. 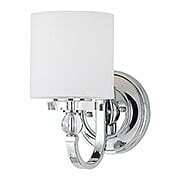 Despite its modern flair, the Margeaux Single Sconce is grounded in ancient themes. The arms are stylized versions of a burning torch, the openwork body derived from an armillary, or celestial globe. The result is familiar, yet forward looking, suiting settings from the antique to the futuristic. For a softer look, go with mellow vintage brass, or for high impact, choose bright polished nickel! 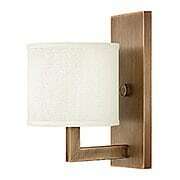 Our Clancy 1-Light Wall Sconce adds elegant style with vintage overtones to your decor. 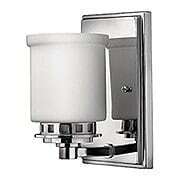 Its transitional design features a clear-glass urn, retro construction elements, and smooth, soft curves. 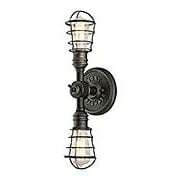 This fixture is a wonderful choice for your entry, hall, or dining area. 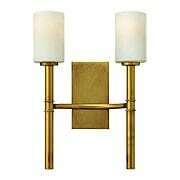 Despite its modern flair, the Margeaux Double Sconce is grounded in ancient themes. The arms are stylized versions of a burning torch, the openwork body derived from an armillary, or celestial globe. The result is familiar, yet forward looking, suiting settings from the antique to the futuristic. 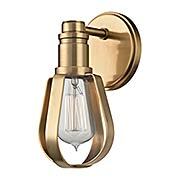 For a softer look, go with mellow vintage brass, or for high impact, choose bright polished nickel! 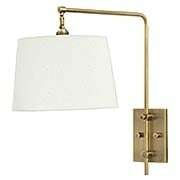 Our Crown Point Wall Lamp brings contemporary styling to your decor. This downbridge design features a smooth column, linen hardback shade, and adjustable height and shade angle to direct light right where you need it. 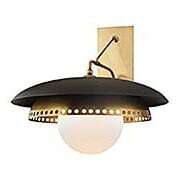 Available in an array of popular finish options, it offers a warm, yet dramatic glow. Comes complete with clear 8' cord. 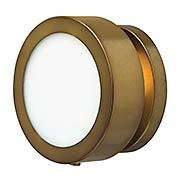 The Terrell 1-Light Wall Sconce brings a fresh look to contemporary interiors. 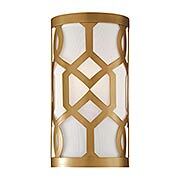 Bold geometric lines paired with a crisp, etched-glass shade creates an elegant look for today's sophisticated decor. Ideal for your entry, hall or dining room. 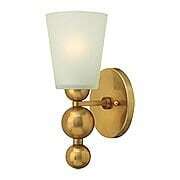 The utter simplicity of our Virtuoso sconce makes it fitting accent to any room. 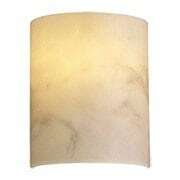 Its half cylinder shade is actually glass, infused with genuine stone dust to simulate antique alabaster. Creamy and lightly veined, it creates a warm and elegant glow. 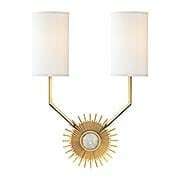 The Magique 2-Light Wall Sconce brings a 1960's vibe to your decor. 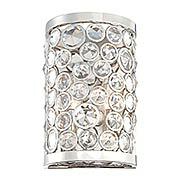 This striking fixture features jewel-like crystal accents and a gleaming polished nickel finish. Display this eye-catching design in your dining room, bedroom, or entry. The city that never sleeps inspired the urban design of the Manhattan 1-Light Wall Sconce. 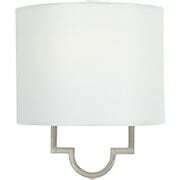 Its chic, clean look features a smooth, gleaming finish and cylindrical, opal etched-glass shade. Ideal for a variety of interiors, it shines with contemporary flair. 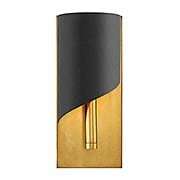 The asymmetrical silhouette of the Gigi Wall Sconce makes a dramatic statement. Its sleek lines impart both glamour and sophistication with a stylish, two-tone heritage brass and stain-black combination. A Mid-Century design grounded in Colonial traditions, the Collier 1-Light Wall Sconce incorporates the best in retro simplicity. Cast knobs, hinges, and stems in a heritage-brass finish convey sleek elegance for a look that is at once modern and timeless. Its seedy-glass hurricane shades are ideal for vintage filament bulbs (not included). 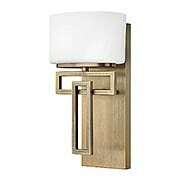 The utter simplicity of our Virtuoso sconce makes it fitting accent to any room. 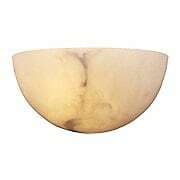 Its half bowl shade is actually glass, infused with genuine stone dust to simulate antique alabaster. Creamy and lightly veined, it creates a warm and elegant glow. Inspired by dynamic designs of the 1950s, our Zelda sconce makes a bold first impression. The striking silhouette results from a stack of graduated spheres, counter-balanced by a tapered glass shade. For a softer look go with mellow vintage brass, or for a splash of drama, choose brilliant polished nickel! 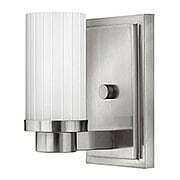 Inspired by mid twentieth-century design, the Primo wall sconce is simple, yet sophisticated. Its lustrous brass frame accentuates a posh black shade, bringing a hint of glam to traditional and contemporary interiors. What a luxurious addition to almost any room. Bring cool, crisp style to your Mid-Century modern home with the Jennings collection. The geometric screen of this sconce surrounds its white linen shade for bold contrast, while the glass diffuser creates a soft, flattering light. It is suited for entries, halls, and beyond. Understated style and a subtle light source make the Atlantis collection a must for Modern exteriors. Artfully composed of extruded aluminum with a durable powder coated finish, each piece is elegant and weather tight. 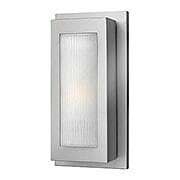 Features etched glass panels top and bottom for increased illumination. 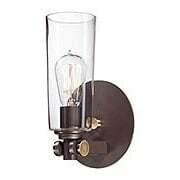 The Conduit wall sconce brings a touch of industrial style to any space. Constructed of hand worked iron, it features protective wire cages and a stamped back plate, lending an authentic look. 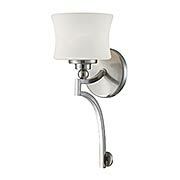 Finished in old silver, this eye-catching design is suited for entryways, hallways, and bedrooms. 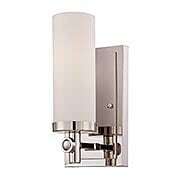 Sleek, simple and compact, the Titan Wall Sconce is tailor made for your entry, hallway or stairwell. Made of durable aluminum with a powder-coated finish, the low-profile design works indoors or out. Choose from buckeye bronze and titanium finish options. The Red Hook Collection refines indoor lighting to its basic elements. Using machine-age design as a touchstone, this wall sconce houses an Edison-style bulb within a smooth candle cup of machined precision. Its flat-band whisk cage gives a nod to city kitchens and other industrial settings, where such styles were first seen. A unique update of Danish Mid-Century modern lighting principles, the Herkimer Collection brings a unique look to any contemporary home. 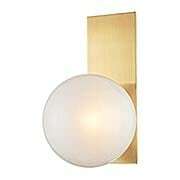 The thick top shade of this wall sconce contrasts in texture and color with its smaller perforated shade, while an etched opal-glass shade hangs low, softly diffusing the light. Available in two classic finishes, it is sure to get noticed! 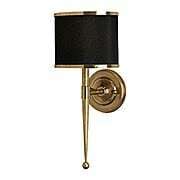 The Borland Wall Sconce adds a hint of glamour to any decor. Quartz crystal bejewels the center of its glamorous starburst back plate, while sleek arms and crisp drum shades complete the ensemble. 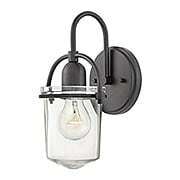 Suggesting energy and luxury, it is suited for your entry, hall, or dining room. The simple design of the Hinsdale Collection adds a playful twist that is sure to get noticed. An orb of light, made of etched glass, floats effortlessly on the square metal back plate of this delightful wall sconce. The result is a pleasing diffusion of light. 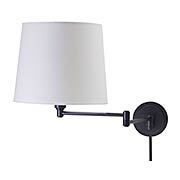 Our Townhouse Swing-Arm Table Lamp brings contemporary styling to your decor. This sleek design features a smooth column, linen hardback shade, and adjustable arm to direct light right where you want it. 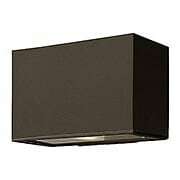 Available in an array of popular finish options, it offers a warm, yet dramatic glow. A switch at the socket offers convenient on and off.